Do you like word game or puzzle game? If you do, you will like this game. 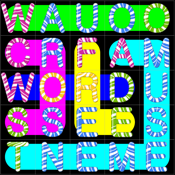 "Word Free: Cross" is a combination of word and puzzle games. And supports multiplayer, allowing you to challenge other players. The board is full of red, green, yellow and blue letters, red represents initials and green represents the last letters, and yellow represents cross letters. Try to connect these letters to a word, and all letters have to be used and each letter only for a word. But the yellow letters for two words. 1. This game uses basic words and common words (about 1300 words). Play for all ages. 2. Challenge mode support Game Center multiplayer, allow you to challenge other player.